You’re really going to do it this time? Your evil corporate overlords will let you? (SPOILERS) Two notable films on the subject of journalism were released in 2015, one concerning dogged reporters successfully exposing the cover-up of decades of institutional wrongdoings, the other about still-diligent reporters tripping up and having knives sharpened at the expense of their perceived shoddy workmanship. One went on to win Best Picture Oscar, the other received mostly tepid reviews and made only a couple of million dollars at the box office. Truth admittedly veers towards the tepid, truth be told, but it didn’t deserve such an unmarked interment. I’m just not so sure there’s any conspiracy theory to be fashioned from its failure. The problem lies firmly at the door of writer-debut director James Vanderbilt, who previously delivered a sterling piece of factual screenwriting for David Fincher’s Zodiac. His direction is unconvincing and underdeveloped, and not in the unshowy, understated vein that worked for Tom McCarthy’s Spotlight; the results feel movie-of-the week as, sadly, does his lead-by-the-nose writing and characterisation. 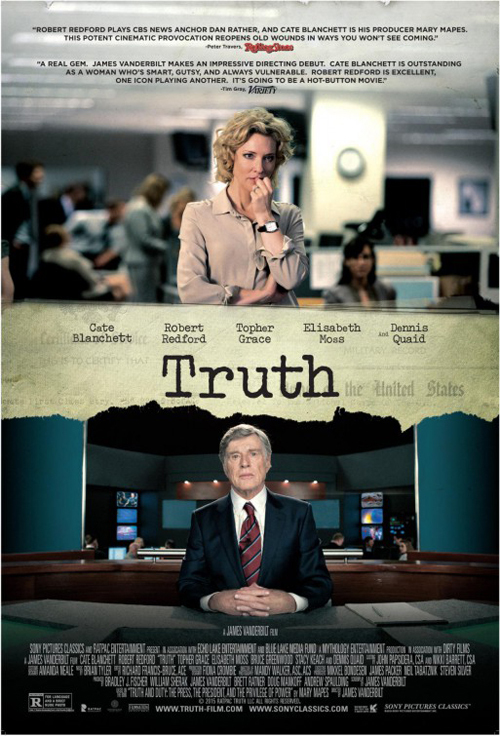 Vanderbilt adapted the memoir Truth and Duty: The Press, the President and the Privilege of Power by Mary Mapes (played here by Cate Blanchett), the producer of CBS Dan Rather’s 60 Minutes, detailing the fallout from their 2004 investigation into and report on Dubya’s military service, which everyone knows (I say everyone, hosts of people still voted for him not once but twice, at least that’s what the polls tell us) shows him to have been in dereliction of duty. He’s just that kind of guy. If he could get away with it on account of daddy, he would. And did. There’s more than enough juice here, and Vanderbilt has assembled a strong cast, although Blanchett is possibly the least impressive of the line-up, tending towards caricature when something subtler might have played better. It doesn’t help that Vanderbilt has gone overboard in embroidering Mapes’ home life (what a good mommy she is, what a supportive husband she has), to the point of insipidness; some of that is probably necessary, but it shouldn’t be distracting from the story. Redford’s great though, bringing the weight of a guy who actually did make a classic movie about investigative journalism, the classic movie about investigative journalism (All the President’s Men), even if one might conjecture conspiracy within the uncovering of that conspiracy (as in, Woodward and Bernstein were, some posit, the convenient players in a sanctioned ousting of Nixon). I don’t really know Rather’s style and approach, and I’m not especially familiar with 60 Minutes, but Redford effectively portrays a bastion of old-style, when-it-meant-something journalistic pride (not that such an era ever really existed, but it appeared to exist, and that’s what counts) that hearkens to the like of Clooney’s Good Night, and Good Luck. Indeed, Rather’s retired signoff “Courage” sounds straight out of that era. Both Truth and Spotlight share a very real eulogising for the passing of prioritising the actual nuts and bolts and hard graft of the job in the age of the Internet, and the political motivations of CBS and its parent in firing Rather – I have little time for the argument that it was all fair and above board – only highlight the farce of those vouching for real news being the very ones fanning the flames of its death; the situation now really is to “just read out what is handed to us”). There are problems with the Rather presence, in as much as the likes of Topher Grace’s Mike Smith is given to rapturous veneration of the man as the reason he entered journalism, but because he isn’t centre stage, the character succeeds in the main as an iconic form. Likewise, Grace’s young firebrand is good fun, invigoratingly unpersuaded by the wheels and processes of the corporate system and given a particularly barnstorming rant at the man firing him (David Lyons’ Josh Howard), pointing to the political links between Viacom and George W before being led from the building with a parting “They’re going to screw you too, you know”. In the interests of balance, one wonders slightly why Viacom wouldn’t have put the kibosh on the story earlier had that been their plan, although the conspiracy view holds that the story was put out there so doubt could be cast on it. The doubt being the veracity of the memos purporting to detail Bush’s military indiscretions, which despite having seemingly entered lore as fakes, have neither been proved or disproved, as the originals have never been provided to inspect (the font argument certainly doesn’t hold up as a case for dismissal). Grace’s outburst leads into the best section of the picture, ironically the last 30 minutes, as Mapes is hung out to dry by her bosses. Maybe it’s because a courtroom, even a kangaroo courtroom, scene is always good value, but the picture almost kindles something approaching a fire under it at this point. Vanderbilt is actually quite good with depicting the way factors that became decisive on her fate were casually batted off by Mapes; it’s the way he underlines other aspects with treacly music and characters pronouncing how amazing they are that rankle, or clumsily introduces a brief subplot about Mapes dad (“What about my father?”) And, when the bottom line is voiced (“The system is rigged. It always has been. You know that”), you’re left wishing the whole picture had been as unflinchingly cynical. It doesn’t need bow-wrapped gushing like “Hey, Mary. I believe you” from her lawyer (Andrew McFarlane). There’s fine support on hand from Dennis Quaid as a seasoned ex-colonel on the team and Stacy Keach as the crucial witness, not enough of Elisabeth Moss and Bruce Greenwood (but can that guy leave an impression in just a few seconds), but Truth leaves a general feeling of a missed opportunity. Other cases involving the press and politics have run aground at the box office while nevertheless making good pictures (Fair Game), but Truth is merely middling. It needed to be angry to make an impact, but Vanderbilt directs with indifferent resignation. This is the way things are going and there’s nothing that can be done. Probably true, but he could have been more impassioned about it.